Christopher Wm. White is delighted to have joined the faculty of the University of Massachusetts Amherst as Assistant Professor of Music Theory, having previously taught at The University of North Carolina at Greensboro and Yale University. Chris received his PhD from Yale and has also attended Queens College–CUNY, and Oberlin College Conservatory of Music. His articles have appeared in Music Perception and in Mathematics and Computation in Music and he has presented papers at national meetings of the Society for Music Theory as well as several regional conferences. His research investigates algorithmic and linguistic theories of music by presenting computational models of musical style, function, meter, and communication. 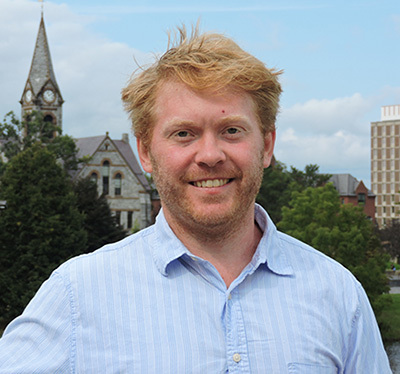 Chris' research has also focused on geometrically modeling early 20th-century musics, especially the music of Alexander Scriabin and Alban Berg. Chris remains an avid organist, having studied with Haskell Thompson and James David Christie. As a member of the Three Penny Chorus and Orchestra, he has appeared on NBC's Today Show and as a quarterfinalist on America's Got Talent. Link to Prof. White's "CogSci Initiative" talk on Jan. 29, 2016: What are "Words" and "Parts of Speech" in Music?